Forget about Windows 9, that would have been Microsoft's next OS under Steve Ballmer. The company is taking a more radical approach with its most treasured product. 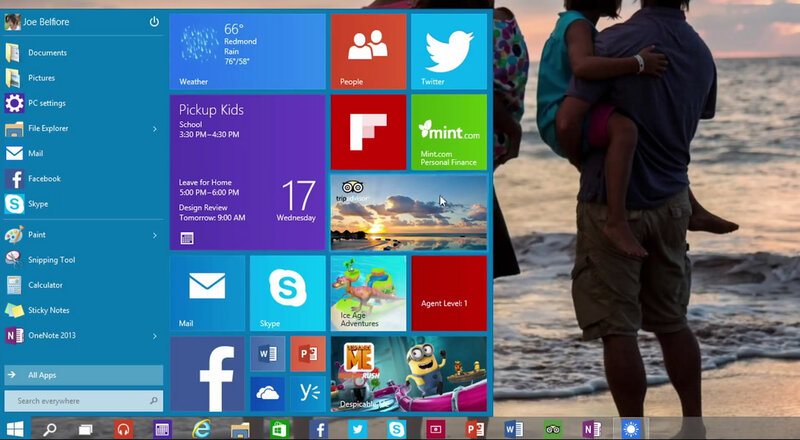 Update: Download the Windows 10 Technical Preview now. Microsoft hosted a Windows event in San Francisco that was meant to focus mostly on the enterprise side, but it actually grabbed headlines for the new name and direction the company is taking with their flagship operating system. Initially it was hinted that business folks would be the first to take a peek at Windows 10, the upcoming OS will provide a 'novel' way to separate corporate from personal information, it will be backwards compatible with enterprise tools, and provide a configurable Windows Store. However, by the end of the event it was all about enthusiasts and developers. A Technical Preview will be released tomorrow. "We want all these Windows 7 users to have the sentiment that yesterday they were driving a first-generation Prius... and now with Windows 10 it's like a Tesla. They don't have to learn any new way to drive." Joe Belfiore, VP of the Operating Systems group, showed off Windows 10 desktop improvements, including the return of the Start Menu. When referring to the failed transition of Windows 8's Modern UI and how it handled the desktop, he said: "We don't want that duality, we want users on PCs with mice and keyboards to have their familiar UI." The new Start menu is customizable, marrying some of the legacy Start capabilities with Modern UI tiles, not unlike what we've seen from the several Windows 8 Start menu replacements, but of course, this time it will run natively. An improved universal search (local, cloud and web) that lives within the Start menu is getting hyped up, however given the gripes we've had with Windows' search capabilities, even in Windows 8.1, we'll believe it when we see it. Modern UI apps designed for touch now work windowed in the desktop, and will be compatible with a mouse and keyboard. The intent is that if you write one app for Windows 10 it will work across mobile or desktop devices, or in hybrids like the Microsoft Surface. There's a new multi-tasking button in the taskbar called "Task view" that gives an overall view of all running applications and virtual desktops, similar to Expose in OS X. The addition is certainly welcome, but it's too bad it has to wait a full year until it arrives. Microsoft is touting "Continuum" which is their way to say Windows will adapt, showing or hiding features depending if you are on a touch device or using the mouse. The Charms bar is still there in the preview, but it sorts of dissappears for desktop users and will receive improvements for touch users before release. Windows' snap capabilities have also received a marked improvement, you can now select up to four applications and arrange them in a 2x2 grid. When you snap a window on the side, the OS will move other apps so they are not hidden behind and will suggest if you want to snap a second or third application. Looks like a breeze to work with (see it in action in the video above). Windows 10 Technical Preview is slated to roll out tomorrow and it will be open to everyone, first targeting laptop and desktop users, with a build aimed at servers shortly thereafter. The Windows Insider Program website is where you need to go to grab it (tomorrow!) though Microsoft warns that this will be a very early build. Windows 10 has received a "later in 2015" release date. More consumer-facing features won't be shown officially until next year's Build conference in April, which hints we are still a year away from Windows 10's final release.